Beautifully built, highly versatile and with a stunning sound. A unit of the highest quality. Superb sonic and build quality. Simple yet effective EQ. Extremely versatile. 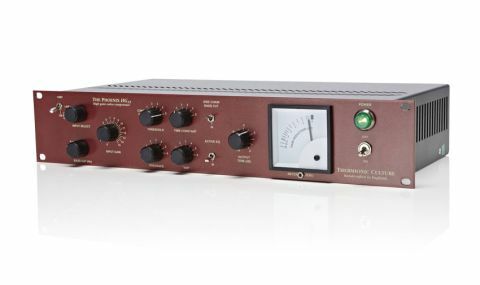 Thermionic Culture has a very well-earned reputation in professional circles for some quite stunning valve processors. This latest addition to the range couples a new version of the excellent Phoenix compressor in mono form with a high gain input stage, simple EQ and phantom power. The Phoenix HG 15 is an impressive looking unit, with its front panel sporting eight large knobs, four toggle switches, a big jewelled power lamp and an enormous meter. On the back there is the standard IEC mains connector, XLR in and out and a phono link socket. The controls can be split into three basic sections. To the left are the three knobs and one switch affecting the input. Input select switches between line, pad and mic. The latter two can supply phantom power which can be switched using the latching toggle. Latching switches are a good idea, especially when only one input socket is used, as you have to make a conscious effort to put it on. But we would still prefer to see an indicator light, as the lack of one does leave a margin for error. Below input select is a bass cut operating at either 50 or 100Hz. A sensible choice of frequencies and the filter slope sounds good, neither too extreme or too shallow. Next is the continuous input gain which as you would expect goes from 0 to 15! Of the four knobs in the centre, the upper two affect the compression settings. The first is threshold and has six clickstops, from off to maximum compression at 5. The second is the time constant and again has six settings each giving different combinations of slow, medium and fast attack and release times. The settings work well and it's easy to find one that suits the sound you are addressing but we can't help thinking it might have been better just to have three position attack and three position release controls. To the right of these is a sidechain bass cut that filters out below 100Hz in the detector circuit to avoid too much pumping in the low end. Finally come the two EQ controls, the first of which is presence. This is a reasonably broad band boost centred at 3kHz to put a bit of bite where it's needed. The second is Air which through numbers 1 to 3 puts a shelf at 10kHz, 13kHz and 18kHz respectively and a peak at the same frequencies through settings 4 to 6. The last knob is a gain attenuator should you need to pull back the output level. "The compression goes from subtle to punchy, dependant on time constant settings"
While the principal purpose of a unit like this is as a 'voice channel' the HG 15 is much more than that. I used it on a wide variety of sources and it came up trumps every time. Ignoring the EQ side, the unit has a beautiful warm tone with smooth highs and full lows. The compression goes from subtle to punchy, dependant on time constant settings and, as you can high-pass filter the source and the side chain, it's easy to avoid any low-end induced pumping, especially on close mic'd vocals and guitars. The EQ takes it to another level beyond this. The presence does exactly what you would expect and sounds very natural and musical. The Air really opens out the high-end allowing things to cut through without harshness and without losing any depth. Low-end response is great and, even with DI'd bass guitar with heavy compression, the sound is still tight and focused. On top of that you can also use it as a straight line level compressor and, as you can link them, you can easily set up a stereo version with two units. This is a great sounding unit and as a main recording channel would give excellent results on any sound source. Highly recommended.